Deep down I knew I could beat him, but I’d never try. I matched him stride for stride and I was only in 3rd gear. As we neared the finish line at the end of the soccer field, I glanced over anxiously at the rest of my grade 6 class, taking to heart every judgmental expression. They watched in mocking amusement as this exhausted boy was using every ounce of his energy to stay ahead of me in our head to head race. He was the fastest boy in our division and to be beaten by a girl was a terrifying reality he was facing. He knew the onset of degrading comments were to follow – insulting both of us in their crushing wake. He was a nice boy, one of only a few in a school full of brutal bullies. So I slowed down enough to let him win by a few steps. I let him walk away with his pride intact. In suppressing my best effort, I was able to ensure he maintained his status at our school. But what did I give up in the process? Afraid to show my true capabilities, I became fearful of accomplishment. I set out to define myself – who I am and who I aim to be. The company I now keep is a collective group of people, of both sexes, all striving to perform at their best and our aim is to encourage other runners to do the same. We all advocate for each other. I learned that as a female, I didn’t need to let boys win. That was not my job. My role was to be proud of myself and support other women around me who were also striving to be their best. I would no longer feel the urge to stay behind and chase the pack. I would ignite the flame inside me and shine as bright as I can. 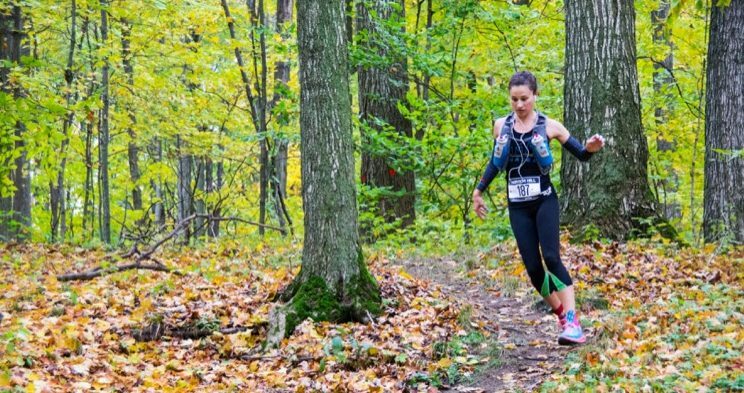 This past year, at the ultra-races that I have participated in, I have witnessed women cross the finish line in 1st place – not just 1st female, but 1st overall. They were praised and celebrated by their fellow racers, both men and women, as they climbed to the top of the podium. This mutual encouragement ensures that we are all the best versions of ourselves as runners…and as humans.